Not all Knights owned land, nor did joining an order or being part of a lord's retinue suit all knights. Many choose to offer their expertise in warfare to whomever can afford them. These knights are armoured in plate mail and wield lances and swords. 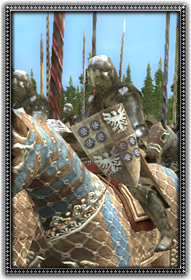 Capable of deadly charges and impressive melee combat, these knights are well worth the money. A Mercenary Quarter decreases happiness and loyality. But if new mercenaries arrive from time to time in the Quarter, a trader will propose them to you. A Mercenary Barracks decreases happiness and loyality. But if new mercenaries arrive from time to time in the Barracks, a trader will propose them to you.